Firevault stores are a turnkey, secure, fire proof storage facility for flammable and hazardous materials, such as, Petroleum Spirits, Paints, Adhesives, Solvents, lnks, Pesticides, Agricultural and Industrial Chemicals. 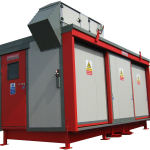 These Firevault stations can offer up to 4 hour protection from Fire and harsh environmental conditions. 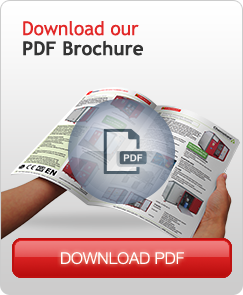 Full fit out of the units can be completed and commissioned in a workshop environment. Our design engineers work with consultant teams to design and manufacture bespoke storage units and systems to meet your needs. Transportation can be easily arranged as these units are manufactured to comfortably fit in 20 and 40 ft containers. Fire suppressant systems can also be fitted to client specifications. 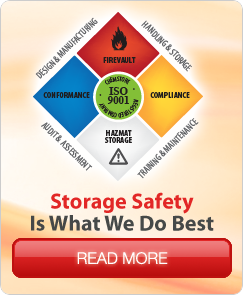 Firevault systems are manufactured to the strictest safety and quality regulated standards, ISO 9001 2008 and CE marked. Manufactured by ‘Chemstore Engineering Ltd.’ to the highest standards utilising only those fireproofing materials, which have been tested to BS 476, part 22, Firevault Stores comply with all relevant Health & Safety Regulations, Insurance requirements and environmental standards such as ISP31000, ISO 14001, EMAS and IPC licensing. Powered ventilation, lighting & heating options etc. A range of optional extras are also available for Firevault units including Ex-rated electrical fittings. When storing and decanting flammable liquids, precautions should be taken to prevent vapours being ignited by the discharge of static electricity. All Firevault flammable materials stores are fitted with a full length copper grounding rail, which is connected to earth. When transferring flammable liquids between containers, grounding cables must be attached to the drums/containers and to the grounding rails. Robust all welded steel framework. Fully welded leak tested bunds fitted as standard. Bund capacities is excess of legislative requirements. Standard Bund: Polyurethane coated steel. Options: Stainless Steel or Polypropylene for aggressive chemicals. Hot dipped galvanized grid mesh floor panels. Spilled liquids pass through grid floor to sump/bund below. Removable to allow access to sump.Floor can be overlaid with checker plate panels to facilitate trolley use. (PVC) finish on internal walls. Walk-in’ units over 6m long fitted with fire escape doors. 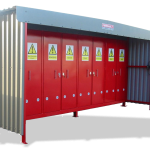 All Standard Chemstore Multi-Drum Units can be supplied as Firevault Stores with One or Five hour Fire Ratings.